It should come as no surprise on a blog called A Modern Day Fairy Tale that we are a family that loves princesses! Of course, we love the fairy tales and the sparkles and the fantasy of it all, what little girl doesn't? But aside from that from the moment that I discovered I was having a little girl, I knew that I wanted to raise her to know that she IS a princess. That doesn't mean that she's spoiled. It doesn't mean that she gets everything she wants. It doesn't mean that she is the center of attention. Quite the opposite in fact. I wanted her to realize that she truly WAS a princess--- the daughter of the King. Good morning, Lord, it’s time to rise. so help me do what’s right. so others will be blessed. If you have a princess loving little girl, this book is a MUST. We have many, many prayer books in our collection, but here's the thing when it comes to kids... you have to approach them from something they love. When you make it fun for them, they are interested and they learn more. When it comes to teaching my kids about important topics like faith and prayer--- what could be more important!? This book does this beautifully. The illustrations are full of princesses and fairy tale scenes that my little girl loves, so already she is drawn in! The prayers are short and sweet--- perfect for a little princess. She might find herself memorizing a few even. The topics are varied, but all things that young girls would need to pray for. They flow easily, and truly are just all around beautiful. My daughter wanted to read each and every one--- over and over again! And I LOVE that! If your daughter has read any of the stories from The Princess Parables, she will love seeing those familiar characters, but if not, this will be a great introduction. My almost 4-year-old loved in and I know many little girls will too! 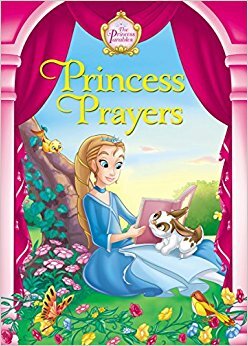 Princess Prayers in available to purchase now.